Digital signage is rapidly becoming a must-have technology for companies operating in the quick service restaurant market. Menu boards and animated videowalls offer convenient features such as the ability to update price, menu, nutritional info, and content easily. Vivid digital displays also prove superior to printed menu boards at grabbing the attention of restaurant guests and up- selling products, providing a fast return on investment. 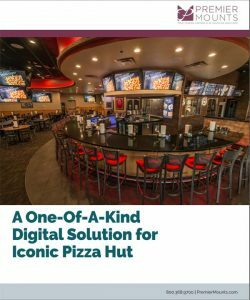 Recently, Premier Mounts had the opportunity to partner with digital signage solutions company Embed Digital to deploy signage for one of the most iconic brands in the world – Pizza Hut. Details can be found in the connected file.